The outing will be to Skye- Sabhal Mor Ostaig, Sleat, on Sat. 27th May. A talk on the history of the college will be given and lunch will be taken at the college. With thanks to; Gaelic Society of Inverness, Highland Council, and Historic Scotland. Donald Campbell Dòmhnall Phàill (Donald son of Paul) was born in Dalnaspidal in 1798. He came to work as a shepherd at Ballachroan in 1822, where his relative was tenant. The last 40 years of his life were spent near Kingussie, at Glen Gynack, where he died in 1875. Five of his songs are recorded in Thomas Sinton's 'Poetry of Badenoch', but he composed many more. Thomas Sinton says of his songs, "Very few of them have been preserved. Nobody thought of taking them down at the time; and in his latter years the old bard could rarely be prevailed upon to sing the songs of his youth." Guma slàn do na fearaibh is regarded as one of the most important songs composed in Gaelic about emigration, and is often referred to in English as 'The Emigrant's Song'. It was composed in June 1838, when he saw a large number of people from Badenoch assemble in Kingussie in order to walk to Fort William on the first part of their journey to Australia. The second best known of his songs is a love song, Duanag a' Chìobair (The Shepherds Ditty) which is also a well known Gaelic song and is sung to the present day. His son, also called Donald Campbell was a merchant in Kingussie and very important in shinty circles, was also a bard. His most popular song was a humerous one, Bàla Ghlinn Truim (The Ball of Glen Truim). Tha bliadhna thrang air a bhith aig a’ Chomunn, mar is àbhaist, agus tha sinn air-leth taingeil gu bheil òraidichean cho comasach air a bhith againn. Tha sinn cuideachd a’ toirt taing do’n Ollamh Mata MacÌomhair, Ceannard 2015-2016, airson an taic a thug e don Chomunn fad na bliadhna bho Sheirbheis Cuimhneachaidh Chùil Lodair, Òraid dìnnear bhliadhnail san t-Samhain: “ Contemporary Gaelic Education: An Overview” agus Òraid: “ Gaelic – just another Minority Language?” aig a’ choinneamh bhliadhnail, 15 An Giblean. Gu math a thèid le Mata san àm ri teachd. Bha deagh Chuirm againn bho chionn ghoirid. Tha ceilidh neo-fhoirmeil a’ còrdadh ris na h-uile agus tha sinn mòran an comain na ghabh pàirt air an oidhche. Fhuair sinn taic bho Maoin Mathas Coitcheann Inbhir Nis agus Buidheann Taighean-òsta Sonas. Tha sinn a’ toirt taing dhaibh uile. Tha a’ chomataidh air pàipearan a thaghadh airson na ath-bhliadhna agus tha sinn an dòchas gun cùm sibh bhur taic ri na h- òraidichean mar is dual dhuibh. Ma tha neach sam bith ag iarraidh lioft gu coinneamh, cuiribh fios thugainn. Bithidh dà choinneamh air an cumail air oidhche Diardaoin an ath-bhliadhna, mar a chì sibh nuair a gheibh sibh a’ chairt bhliadhnail ann am beagan mhìosan. Tha buill den chomataidh a’ deasachadh Transaction LXVII. Bidh dùil ris an leabhar seo a dhol a-mach ro dheireadh na bliadhna seo. Jo Macdonald, Ruairidh MacIlleathainn, David Taylor, Alasdair Maciver and Bill Innes and also to the many faithful members who turn out to these meetings. If you are aware of anyone requiring a lift to meetings, please get in touch with a member of committee. Two of the meetings will be held on Thursdays next year. We wish to convey our sincere thanks to Professor Matthew Maciver for his support and his valuable contribution to the Society’s main events during his year as the Society Chief. Once again the Annual Showcase in Eden Court recently – An Taigh Ceilidh – was very successful and we would like to thank all those involved for providing us with such an enjoyable evening. We would particularly like to thank our sponsors: The Inverness Common Good Fund and Sonas Hotel Group, Isle of Skye. Volume LXVII of the Transactions is being prepared for printing and should be available to members later in the year. We are particularly grateful to those speakers who have submitted their papers in time to allow the preparation for printing the Transactions to go ahead. We would emphasise the importance of forwarding papers to committee shortly after giving a talk to enable the team preparing the Transactions to begin their work. “Professor Hugh Cheape has devised and teaches a postgraduate programme, MSc Cultar Dùthchasach agus Eachdraidh na Gàidhealtachd, at Sabhal Mòr Ostaig, the National Centre for Gaelic Language and Culture. The MSc has grown out of his curatorial and ethnological work during a career in the National Museums of Scotland where latterly he was Principal Curator in the Department of Scotland and Europe. He has published in the subject fields of ethnology and musicology, including studies in Scottish agricultural history, vernacular architecture, piping, tartans and dye analysis, pottery, charms and amulets and talismanic belief. His books include Periods in Highland History (1987) with I F Grant, Tartan. The Highland Habit (1991), Witness to Rebellion (1996) with Iain Gordon Brown, The Book of the Bagpipe (1999), Bagpipes. A national collection of a national instrument (2008), and he has edited Tools and Traditions. Studies in European Ethnology presented to Alexander Fenton (1993) and 'A very civil people': Hebridean Folk, History, and Tradition. Essays by John Lorne Campbell (2000). From 1997 he worked with the School of Scottish Studies on the Tobar an Dualchais / Kist o Riches project to digitize the sound archives of John Lorne Campbell, the School of Scottish Studies and the BBC”. The Chief delivers the address at the Culloden Anniversary Service, April 16th.2016, the Society’s annual dinner on November 11th.and finally at the annual business meeting on April 14th. 2017. A very warm welcome to Hugh in his year as Chief to the Society. The Anniversary Service will be held at the Cairn on Saturday 16th April. This will follow the usual pattern with the Society Chief giving his Address followed by prayers and a blessing by Rev.Norman MacIver, Inverness and Rev Canon Mel Langille, Fortrose, respectively. Gaelic Psalm singing will be part of the service with Donald Roderick MacAskill and friends, Dingwall, leading the praise. The Society’s Bard, Maoilios Caimbeul, will read a poem: Latha Chùil-Lodair/Culloden Day by Iain Ruadh Stiùbhart. 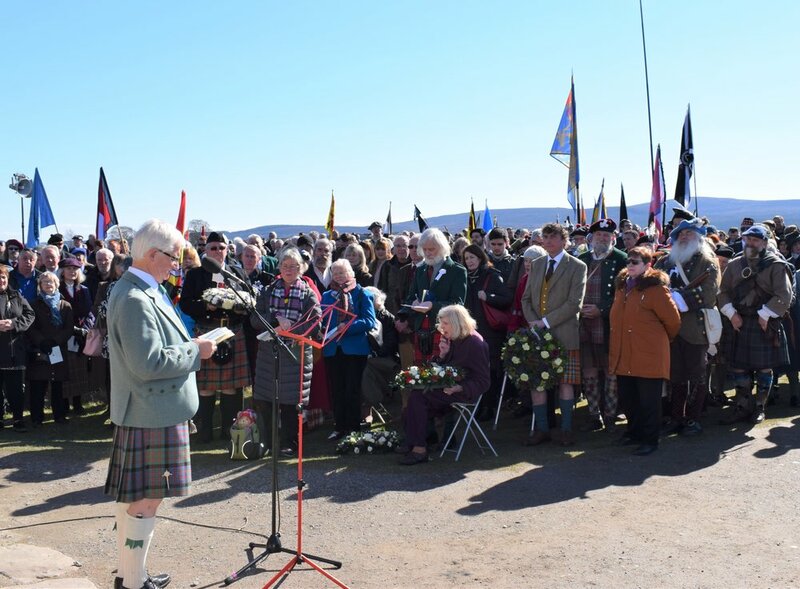 An appropriate lament will be played by the Society Honorary Piper, Mr Euan J. J. MacCrimmon, after which a wreath will be laid on behalf of the Society by Mrs Cheape. The summer outing this year will take place on Saturday 28th May to Gairloch. William McRobbie, Society member, will be our Guide for the day. Please contact the Secretary to book a seat on the coach. The cost is £20 for the coach hire. Please visit our website at www.gsi.org.uk for all information regarding the Society and the latest news. The website has been up-dated and we are very grateful to Sandra Campbell for her work in connection with this. We are also grateful to D.J. Macleod, Librarian, for keeping the Facebook page up-to-date. To keep down postage costs, newsletters will appear on our website. A paper copy will be issued on request. The library has received several donations of books and papers, including a hardback copy of Chì mi (the poetry of Donald John MacDonald) from its editor Bill Innes and various papers relating to Gaelic and economic development from Hugh Dan MacLennan. Members are reminded that a classified catalogue of the library, as well as indexes to the Transactions, can be found on our website, under ‘Archive’. Our Treasurer, Donald Norman MacLeod, is grateful to all of you who complied with our request to pay your subscription by Standing Order. Those of you who have not yet taken advantage of this facility are reminded that this can be done by contacting the Treasurer at any time. Membership is currently £20 per annum and is due for renewal on 15th July each year. Sending reminders to such a large membership is quite costly, so please put this date in your diary to avoid any lapse of your membership. Anyone requiring further information should contact the Treasurer. Students at Universities and Colleges may join the Society at the reduced fee of £10 per annum. Sadly, we have had to record the loss of some of our members in the past few months. We would like to extend our sincere sympathy to those members who are mourning the loss of family and friends at this time. We would ask that you keep us informed of the passing of any of our members in order that a formal tribute may be paid to them at our members’ meetings and subsequently recorded in the Society Transactions. Prof Matthew Maciver will address the meeting: " Gaelic - just another minority language?" Geàrrloch, Gairloch, is a village community on the shores of Loch Gairloch in Wester Ross. A popular tourist destination in the summer months, Gairloch has a golf course, a small museum, several hotels, a community centre, a leisure centre with sports facilities, a local radio station, beaches and nearby mountains. Gairloch, pop. 740 in 2011, is a loosely defined area of settlement, primarily comprising of three main clusters of shops, houses and amenities: the Harbour area, Achtercairn and Strath. Approaching from the south via Kinlochewe, Charlestown and the harbour are met first. Achtercairn is centred on the road junction with the coastal road that leads west to Strath and on towards Melvaig. The Main A832 road heads steeply up Achtercairn Brae leading out of the village to the North and on to Poolewe. Beyond Gairloch to the West a number of small settlements can be found: Big Sand, North Erradale, and Melvaig. Beyond Melvaig the road narrows to a twisting, undulating track ending at the Rua Reidh Lighthouse. The lands around Gairloch have been mostly in the ownership of the Mackenzies of Gairloch since the 15th century, when they were acquired by Hector Roy Mackenzie (died in 1528), with a family house in the sheltered Glen of Flowerdale. The Mackenzies were clan leaders in the traditional sense and were known for their attachment to their tenants. During the 19th century, Sir Hector Mackenzie and his sons Sir Francis and Dr John Mackenzie refused to evict a single tenant during the clearances, despite the estate running at a loss. As a result, evicted Highlanders from other communities came to live in the area and has caused Gairloch to maintain a thriving community even today. The Mackenzies were also keen gardeners. The glen has a microclimate and vegetation that are home to a diverse range of natural life. Dr John Mackenzie states in his memoir that his father was able to grow fruiting peaches outdoors. Osgood Mackenzie created the famous Inverewe Garden in nearby Poolewe. There is a walk up the Flowerdale burn, going past the Mackenzie house to an impressive waterfall at the head of the Glen. A Pictish stone with a distinctive carving of a salmon was found in Gairloch in 1880. This is one of the westernmost sites where such a discovery has been made. The stone is now on display in the Gairloh Heritage Museum. The site of a 1945 plane crash at the Fairy Lochs near Gairloch is now a designated war grave. The crash site, close to the village of Badachro, has been preserved as a memorial to the USA AF servicemen who lost their lives in the accident. Gairloch is the final resting place of the renowned Gaelic Bard Uilleam Ros, William Ross (1762-1791), known as’ the Gairloch Bard’. Ross was born in Broadford on Skye. He settled in the Gairloch area and became a schoolmaster, and died at the age of 28 in Badachro. Departure point: Highland Council car park on Glenurquhart Road. William will advise us what to visit there etc on arrival. Lunch – one is free to choose where to have lunch. I understand the museum operates a cafe. The journey back to Inverness will be by Dundonnell. PLEASE INCLUDE NAME, ADDRESS AND TELEPHONE NUMBER. "WITH HERDS FROM THE MOOR TO THE SEA'S EDGE"
The next meeting of the Gaelic Society will be on Friday 22nd January when David Taylor will give a talk on the Badenoch drovers. The meeting is at 7.30pm in the Inverness Gaelic School and is open to the public. Linda MacLeod, North Uist, will give a talk on the Gaelic bards of Baleshare (North Uist) on Friday 2nd October at 7.30pm in the Inverness Gaelic School. The talk is in Gaelic, with simultaneous English translation. Non-members of the Society are welcome. The Society’s Hon. Treasurer, Donald N. Macleod, is grateful to all who have complied with the request to pay the annual subscription of £20 by Standing Order. You are reminded that membership is due for renewal this month of July. The monthly talks resume on Friday September 11th when John Murray will give a talk on Reading the Gaelic Landscape. We look forward to seeing many of you at the meetings. The Gaelic Society’s annual outing took place on Saturday May 16th and this year was to Strathnaver. Our first stop was at the Altnaharra Hotel where we were joined by Jim Johnston, former Head of Farr High School in Bettyhill, who was our entertaining and highly informative guide for the rest of the day. On the journey through Strathnaver we passed various Clearances and prehistoric sites, stopping off at the Memorial to Donald MacLeod of ‘Gloomy Memories’ fame and Syre, the site of ‘Patrick Sellar’s cottage’, where we visited the old church. Our next stop at the Srathnaver Museum in Bettyhill coincided with their Open Day and a local VE Day parade. We finished off our tour with an excellent lunch (prepared by Catriona Mackay) in Strathy Hall, followed by a presentation on the history of Strathnaver by Jim Johnston, before returning to Inverness via Tongue. 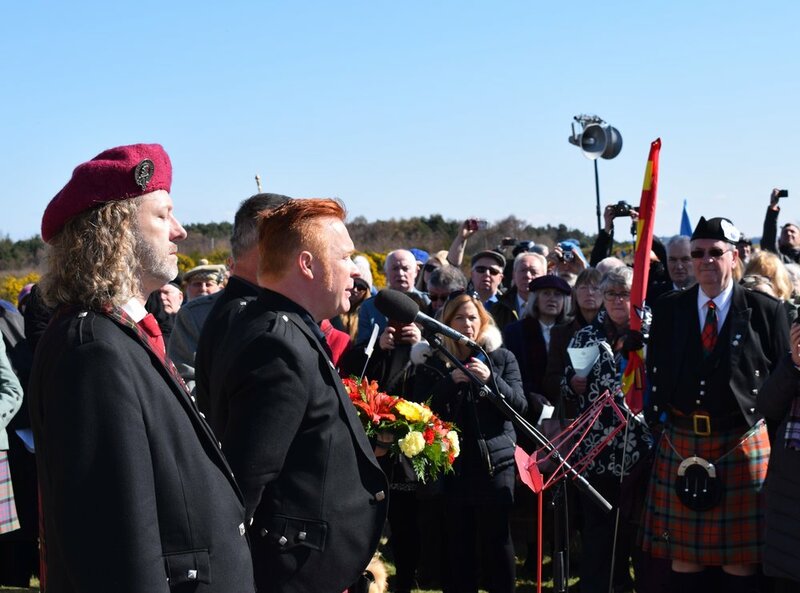 Photographs and details of this years Culloden Anniversary can be seen here. Srath Nabhair, Strathnaver, is the wide, fertile valley through which the River Naver flows north from Loch Naver to the sea at Torrisdale Bay, Bettyhill. Today, it is a sparsely populated landscape, but it has a long, rich and varied history. There is evidence of man’s activities from almost every period of history – so much so that a special Tourist Trail has been created to guide visitors to many of the historic sites that lie between Altnaharra in the south and Bettyhill in the north. Two hundred years ago, the valley was occupied by about forty small settlements, each comprising a group of dwellings that were home to between three and fifteen tenant families. As well as the tenant families there were inhabitants who had no rights of tenure. They were the cottars, living in hovels, and were employed as cobblers, weavers, or smiths and engaging in agricultural work. It was a Gaelic speaking community. The people of Strathnaver probably enjoyed frequent cultural activities that included the playing of music, singing, and reciting poems. It is likely that these activities preserved a sense of the history of the community and its valued traditions. It was in the early nineteenth century that the most infamous events in Strathnaver’s history took place – the Clearances. Strathnaver was part of the estate of the Countess of Sutherland and her husband the Marquis of Stafford. They had decided to “Improve” their lands by turning them over to profitable sheep farming and were intent on moving their tenants to new villages built on the coast. Remnants of these coastal villages may be seen today e.g. Poulouriscaig, between Bettyhill and Armadale, a four mile walk from Armadale over boggy ground, is a fine example of a deserted village.The hardships these evicted peoples had to endure, hemmed in to the coast with no anchorage for boats due to the sheer rock faces, can easily be imagined. From 1814, the evictions were undertaken by the Sutherland Estate factor, Patrick Sellar ( whose cottage was behind the Syre Church) He was ruthless in his actions, destroying homes and burning crops to force people from their land. A stop will be made at Lairg, if required, but the main stop for tea and coffee will be at the Altnaharra Hotel. At Altnaharra we follow the road east by Loch Naver. At some point Jim Johnstone, retired Headmaster, Farr High School, Bettyhill will join us to show us some clearance sites. Lunch will be at Strathy Hall, Strathy (caterer preparing the lunch) Please notify me of any special dietary requirements. Jim will probably deliver his power point presentation here. Thereafter, we travel east to Thurso and down the A9 home. Depending on time, a stop at Dornoch may well be undertaken. e iad o’n trioblaid ghèir. ‘s do’n phort bu mhiannach leo. rinn e do chloinn nan daoin’! The Annual Dinner of the Gaelic Society of Inverness will take place on Friday, 13th November 2015 in the Craigmonie Hotel, Annfield Road, Inverness, when the Chief of the Society, Professor Matthew MacIver CBE, will be the speaker.